Should Couples get matching Tattoos? Matching tattoos are incredibly romantic. Deciding to both get your skin inked is maybe even more of a commitment than getting married. Maybe a weird comparison, but it may actually be easier to get a divorce than to get a tattoo removed. On the web, you can find a lot of beautiful, funny, weird and geeky examples of matching couples tattoos. It’s beautiful to see the commitment people make towards each other. On the flipside, there are also the stories of the breakups and people that stuck with looking at a tattoo that makes them feel bad for the rest of their lives. We put together an article that summarizes the good, the bad and the things you need to know. To give you a realistic view so you can make a smart decision. Should you get a tattoo as a couple in the first place? When you are young, in the rush of life and lust, going on adrenalin, it is tempting to get a matching tattoo during this euphoric phase. Most people who regret getting a tattoo didn’t think it over. They just got inked on a night out, don’t do this. This is based on science. Two years to decide about a tattoo may seem very long. The phase of being madly in love so you can not think straight fades after two years of being in a relationship. If everything still feels great after those 2 years, there is more there then just hormones rushing thru your vains. You will be able to make a more rational decision. A trend that we see too often is bars and venues hire tattoo artists by the hour as an attraction. Visitors can get free (small) tattoos. Avoid these like the plague. It may seem tempting to get it free, the barrier is much lower. However, you will get it on an impulse. Also, the quality most likely won’t be that great, even it is a reputable tattoo artist. He/she will be in a rush to do several tattoos in an evening, will be tired and unmotivated to do his/her best work. What do you need to know before getting a tattoo? Look for good hygiene first. The last thing you want is getting some illness because of your tattoo. Look if the tattoo shop is clean, if the artist has a good reputation and the proper training and licences. Research the tattoo artist. Every artist has his/her speciality. Some are better at letters, some are better at portraits. Choose an artist based on the style you want. Lookup their work, ask for references, google them. Cheap always has its price. As with everything, if it’s very cheap, there is probably a catch. You will need to take care of your tattoo. Putting sunscreen on it if you want the colours to stay as the original. You may need some touchups after some years. After the procedure, you will have to disinfect and refresh bandages so your skin can heal. It does hurt. Depending on where on your body you put the tattoo, it can hurt more than other places. What tattoo should you get as a couple? So you decided you want to get a tattoo as a couple. So what do you choose? Nowadays most people search for tattoos online. That is a good start to get some inspiration. However, you want the tattoo to have a meaning. It has to be something special to you. Maybe an interest you are sharing or an experience you enjoyed together. Do matching tattoos have to be in the same spot? Most couples have the tattoo in the same spot, but it is definitely not a requirement! It is the meaning of the tattoo that counts. A tattoo in a different spot can actually be more meaningful, let your creativity go wild! For example, if a man always puts his arm on her shoulder, it can be really nice to have the tattoo on his arm and her shoulder. Or his right hand and her left hand, so if they walk hand in hand you see the matching tattoos. 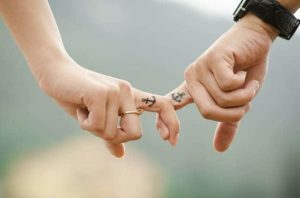 What tattoos should you avoid as a couple? Ultimately it is your decision what you get as a tattoo. Don’t let this article withhold you from getting the tattoo that you want. But here is our opinion of couples tattoos we would avoid. The name of your partner is usually not a good idea. You never know which direction a relationship will go. Even if you think it is ok to have the name of your ex on your body, future partners may not appreciate it to look at your ex’s name for the rest of their life. Having an image/symbol makes this much easier. Don’t do trendy things. Trends fade, go out of style. Take in count that a decade from now that tattoo will still be there. Should you get tattoos of the names of your kids? Your children will always be a part of you. Whether you break up with your partner or not. So yes that is another story. Most kids have a good relationship with their parents. Not all, but let’s say that the chance of breaking up with a partner is much higher than having a bad relationship with your kids. The mere fact that you want a tattoo of your child’s name permanently on your body probably means you are quite committed to raising your kid well. Can you remove a tattoo if you break up? Yes, you can remove it. There are some important things to take into account if you want to remove a tattoo in a good way. To avoid scars, you need to take it slow and remove a tattoo in several procedures. The more colours it has, the more time it will take. Tattoos are removed with lasers that work on a certain frequency. Every colour that is in your tattoo has to be removed with a certain laser frequency. If you want to remove too many colours in one treatment, that will stress the skin too much and will leave scar tissue. That is why you want to take it slow. Depending on how many different ink colours there are in your skin, it can take up to 4 or more treatments. Between every treatment, there have to be several weeks in between so the skin can heal. Getting a matching Tattoo can be one of the most romantic things you do. It is a lifetime commitment. Something that will link you for the rest of your lives. If it is well considered, it can be a wonderful commitment to each other. If you think this article was good information, please spread the Love and help us Romantify the world! Share this article on Pinterest, Facebook or any social media account of your preference. Can you Increase Love Hormones? How to do calligraphy on your wall?